It’s no secret that travelling gives you the opportunity to meet people from all walks of life, from all over the world. Steven and I grew up in Newfoundland, an island in the most eastern part of Canada, where the people are known for their kindness and hospitality. We thought we had experienced everything that kindness has to offer, but let me tell you, we have been blown away by the generosity of the people we’ve met through our travels. I thought it would be nice to share some of those experiences with you. I could write a book about our unforgettable experiences (and maybe we will one day! ), but here are some of our favourites from the last 8 months. We wrote last year about the most amazing tour guide we’ve ever had. 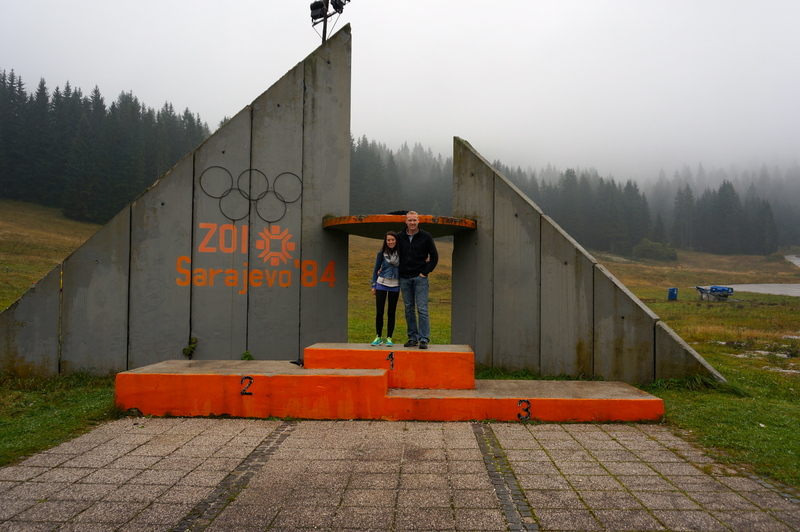 We had booked a one day tour with Ervin to show us around Sarajevo, and we learned so much from him that day. Our visit to Sarajevo coincided with Eid, a huge Muslim celebration and we were scheduled to take a bus back to Austria on the first morning of Eid. Worried that we would have trouble getting a taxi the morning of our departure, Ervin insisted that he take care of it. Sure enough, at 5am on the day of our departure, there was Ervin waiting outside for us in a taxi. He escorted us to the bus station, waited with us at a cafe until our bus arrived and saw us off. I should add that he had a full day of tours booked for that day, so he wasn’t just heading home to get back in bed for a nap. Ervin did this with absolutely no expectations for anything in return, just from the kindness of his heart. He really made our trip to Sarajevo one to remember. Sadly, we can’t seem to find the picture we took with Ervin, so a picture that he took for us will have to do! 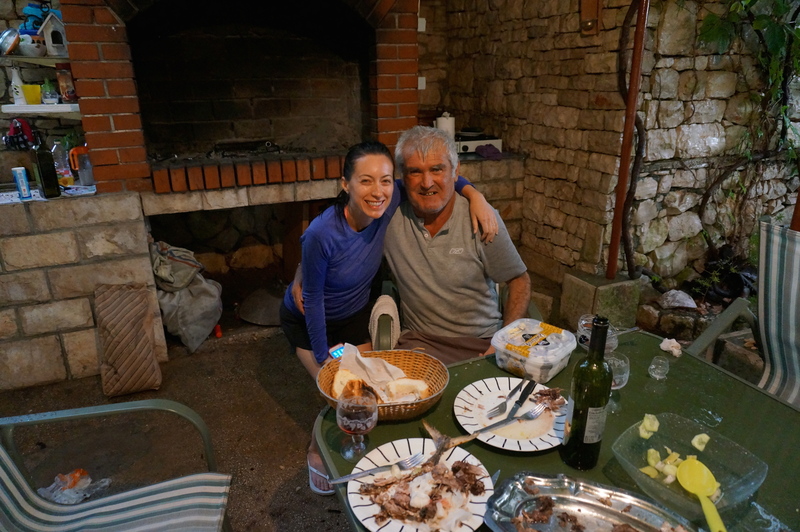 Then there was the unforgettable host we had during our visit to Vis, Croatia. As soon as we got off the ferry in Vis, Milos was waiting for us in his old red hatchback. Driving to our accommodations, he beeped the horn and waved at everyone as we drove past, and we knew this would be a week to remember. He didn’t speak any English, we didn’t speak Croatian but thanks to Google Translate we made it through the week. One night, in the middle of a torrential downpour, Milos cooked dinner for us (fresh fish he had caught earlier that day). We communicated using our phone, and by the end of the night, he had brought me inside his home to show me pictures of his beautiful wife who had recently passed away. The day before we left, he tried several times to communicate something to Steven, but we couldn’t seem to figure out what it was. Departure day came and as Milos was driving us back to the ferry terminal, he pulled into a little convenience store, dragging Steven in with him. He wanted the clerk to translate for him. It turned out, he was trying to offer for us to stay longer, for FREE. Unfortunately, we had already booked accommodations somewhere else that night so couldn’t stay longer, but our time in Vis with Milos remains one of our favorite experiences of this entire trip. During our recent visit to Saigon, we stayed with a lovely couple through Airbnb. 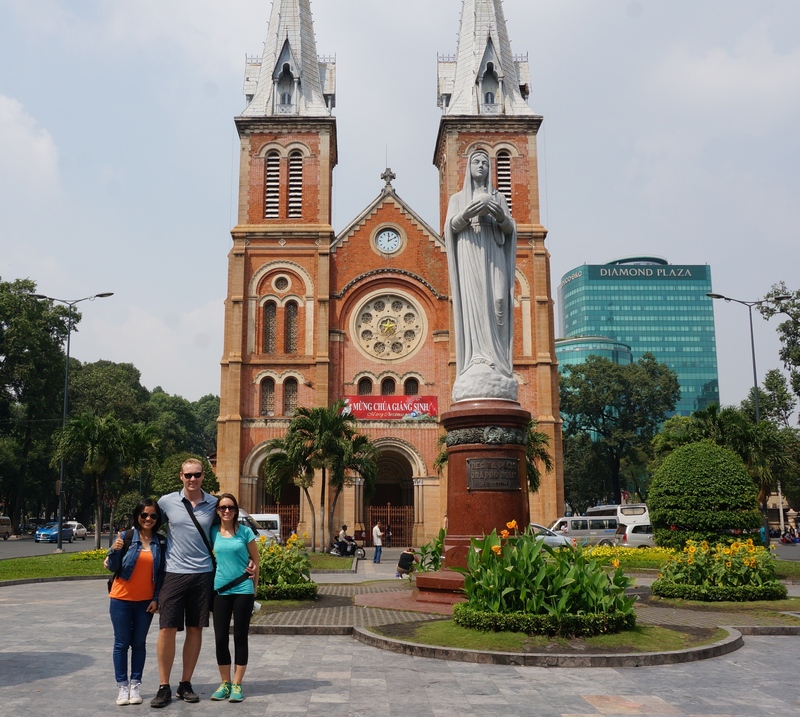 When our host’s sister, Minh, graciously offered to take us on a tour of the city, we didn’t hesitate. She showed up bright and early on Saturday morning, ready to take us exploring. I should add, she also works a full-time office job and is in the process of completing her Masters. She took us all over the city and at the end of the day, refused to accept any form of payment from us (we had to convince her to let us buy her lunch!). She just loves showing people her city, and uses the time to practice her English. We got real insight into the history of Ho Chi Minh City and Vietnamese culture, all thanks to our gracious tour guide! At the end of our time in HCMC, we decided to take a cruise of the Mekong Delta. Soon after departing, Steven and I started chatting with two sisters, Angela and Clare, who were seated next to us on the boat. They were visiting from Australia, and of course, our eyes immediately lit up because we absolutely love it there. We told them about our upcoming visit to Australia, and without hesitation, Angela said “you have to come to Adelaide and stay with us. We live right next to the beach, you would love it”. We couldn’t believe that we had just met them and they had already invited us to come stay. We left it at that, and enjoyed the rest of the day. As the tour finished up, Angela said again, “I really mean it, you are most welcome to stay with us if you come to Adelaide”. And so, tomorrow we are flying from Melbourne to Adelaide for a quick three-day visit with Angela and Clare! We’re so excited and completely overwhelmed by the kindness already extended to us, and we haven’t even arrived yet! During our recent visit to KL, we spent a few nights at an Airbnb just outside city centre. After showing us around the apartment, our host Sean and his wife offered to bring us to the grocery store to pick up some food for the week. As we were leaving the grocery store, Sean asked if we would be ok with them taking us to a local market the next night to try some traditional food. Would we be ok with it? Of course we would! I’m not going to lie, the offer was so kind, I asked Steven if he thought they were going to kidnap us. Anyway, I was obviously paranoid. They picked us up after a long day of work (for them of course, we don’t work! ), and took us to a local market. I forgot to tell them about my whole gluten-free, dairy-free, msg-free deal, so when I mentioned it, they quickly found another restaurant for us to check out after the market. 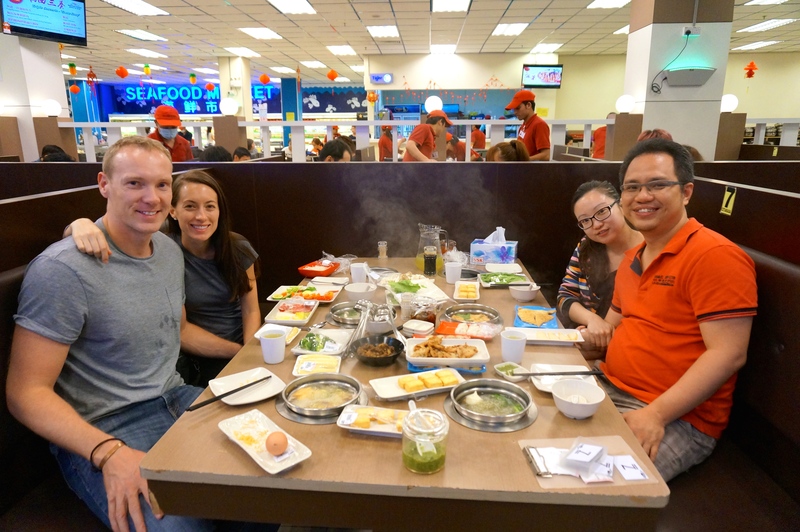 A quick 45-minute drive later – yes, KL traffic is crazy – and we were ready to try out steamboat for the first time! Sean made sure my meal included all of the “frees” in my diet. When the bill came, they refused to let us pay. I mean we even tried sneaking money into their hands, they just would not take it. It was a night to remember, and I hope they come to Canada someday so we can return the favour! 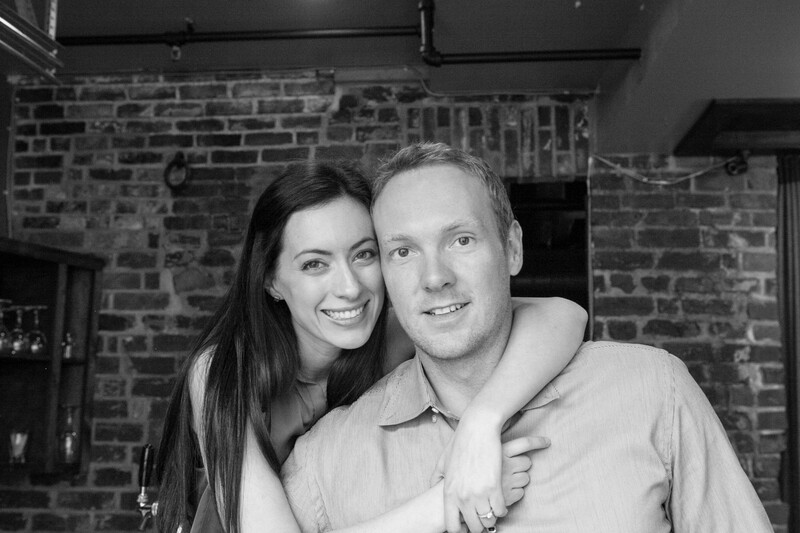 Steven and I are not the same people who boarded that plane on a one-way ticket to Ireland on July 28, 2013, and it’s because of the above experiences and amazing people we’ve met along the way. Many of these experiences wouldn’t have happened if we hadn’t opened ourselves up, been vulnerable and not afraid to ask for help or strike up a conversation with the person sitting next to us. Our definition of travel has certainly changed. It is almost a guarantee that on every trip or adventure we undertake in the future, we will find a way to integrate ourselves into the local culture. Travel is so much more than just seeing a new world heritage site or finding out which all-inclusive resort has better amenities. It is about opening yourself up to the people who live there; the people who make the place what it is and for the most part, they are always inviting. They often want to learn about you as much as you want to learn about them. Our fondest memories on this trip have come from the most unlikely places, simply because we put aside all of our preconceived notions and let our guards down (a little) and we encourage everyone to give this a try on their next trip! Despite what you read in the news these days, the world is still filled with kindness. Kindness, unfortunately, doesn’t make for good headlines. Absolutely loved reading this Jess…what a wonderful trip you are having! OMG, story about Milos is so amazing :). I am so glad you could experience something like that :). Was Milo an Airbnb host? I had to laugh when I read about you asking Steven if the KL couple were going to kidnap you. We shared an Airbnb with an American couple in Sydney who wanted to have a night out with us. We didn’t think we could afford it so declined. At this point they offered to pay. I thought we were going to be kidnapped. Turns out they were just super kind and wanted some company! Wow, I actually got a little choked up reading this post. Beautiful stories! That was a wonderful collection of stories 🙂 Your last paragraph really summed things up beautifully – that’s what travel is all about!